Online solutions provider Ebbon-Dacs has acquired fleet driver licence and compliance specialist Licence Check for an undisclosed sum in line with plans to expand into the driver compliance sector. Based in Derby, Licence Check was established in 2008 by managing director Richard Brown and provides a real-time driving licence checking solution to private and public sector customers. The company also recently expanded its range of services with the launch of the Driver and Vehicle Information Solution (DAVIS) web solution to help manage driver and vehicle fleet compliance. It’s also a founding member of the Association for Driving Licence Verification (ADLV), the trade body for driving licence checking operators. Richard Brown and commercial director Terry Hiles, along with all existing staff, will remain with the business, which will continue to be based in Derby. Robert Pilkington, director of Oxford-based Ebbon-Dacs, said the acquisition made perfect business sense for both companies. “Our strategy is to remain solely focussed on providing online solutions that help connect the vehicle leasing community. Our principle investments will be in new capabilities for our fleet vehicle purchasing and mobile logistics platforms, while continuing to build up our more recent fleet compliance systems area. “DAVIS, coupled with our own latest mobile technologies is the means by which we plan to offer our customers the best platform in this important health and safety area for both end-user fleets and our many customers who provide to these fleets,” he said. Richard Brown welcomed the new relationship and said there were “significant and exciting opportunities going forward and Ebbon-Dacs will allow us to accelerate our compliance services further”. 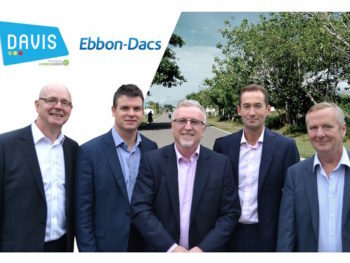 “Ebbon-Dacs wanted to move into the driver compliance business space and saw our DAVIS solution as the most advanced technological solution on the market,” he added. “We were also very impressed with Ebbon-Dacs’ technology platforms which are complementary to our own, as well as their existing mobile applications which we see as a great opportunity for future development both here in the UK and in Europe,” he continued.